Place the right foot flat on the floor outside the left knee. Bend the left leg to the right and place the left heel against the right hip. Place the left arm outside the right leg, and with the left hand hold the right foot or ankle. The right knee should be as near as possible to the left armpit. Turn the body to the right, placing the right arm behind the back. Twist the back and then the neck as far as possible without strain. Remain in the final pose for a short time and then slowly return to the starting position. Change the legs and repeat to the other side. 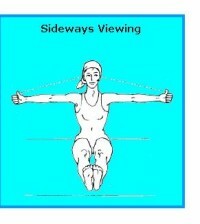 People with very stiff bodies who cannot do ardha matsyendrasana should place the leg that is folded under the hips straight in front of the body. The technique thereafter is the same as the basic form. As soon as the body becomes more supple they should discontinue this simple variation and attempt the full asana. Breathe as deeply as possible without strain in the final pose. When the spinal muscles are sufficiently flexible, try to maintain the pose for at least a minute on each side of the body. On the respiration in the final pose. Tones the spinal nerves, makes the back muscles supple and loosens the vertebrae. Massages the abdominal organs, thereby removing digestive ailments. Helps regulate the secretion of adrenaline from the adrenal glands. Activates the pancreas and is therefore useful in eliminating diabetes. Helps to relieve lumbago and muscular rheumatism. Tones the large number of nerves that arise in the region of the back. whole body, rendering the nervous system more efficient and healthy. Very useful for mild cases of slipped disc. This important asana should be practiced at least once every day. 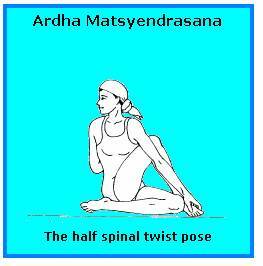 It is a simplification of poorna matsyendrasana.